Formlabs, a 3D printing technology developer and manufacturer, was faced with fabricating a 3D printed sculpture for Times Square. The challenge: it was to be installed for one month in the winter. It had to stand up to cold, wind, water, UV exposure, and New York City crowds. Alongside design studio Aranda\Lasch and engineering firm LaufsED, they created Window to the Heart. The Formlabs team was able to print and finish 1,000 tiles, and assemble and adhere them together to become the final 10-by-12-foot installation in the heart of Times Square. Designing for wind is a core aspect of any structural engineering endeavor. Times Square is an especially tricky location because it is an intersection where several wind tunnels meet. And the standard engineering procedure is to make sure that the safety factors can withstand the wind speeds from 100-year wind speed data. 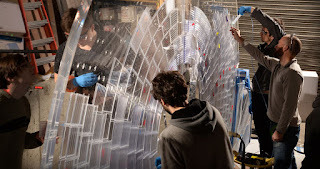 Read how Formlabs approached this design and printing challenge of wind, adhesives, and tiles.